A phenomenon that is receiving a great deal of attention in corrosion studies is Microbiologically Induced Corrosion (MIC). One might ask, do microbes really eat metals? The short answer is No. However, microbes can create the chemical environment that may lead to corrosion of piping systems. This phenomenon occurs almost entirely in stagnant or slow moving water. The most common cases of corrosion where MIC is involved are fire protection and piping systems in new construction, when stagnant water is present. The following case study involved corrosion of a fire protection system through a microbiological process. Three steel pipe sections, three inches in diameter, were submitted to our laboratory for evaluation. The sections were from horizontal sections of a leaking fire protection sprinkler system. The scope of our work was to ascertain the cause of leaks in the piping system based on our evaluation of the three pipe sections. The exterior of the pipe sections were visually examined. There was evidence of metal loss along the edge of the pipes. The pipes were sectioned longitudinally to expose their interior. The interior was partially covered with thick irregular deposits. The deposits covered approximately half the circumference of the pipe. Cleaning of the deposits revealed the presence of shallow pits on the entire pipe surface. The wall thickness of the pipe was measured in a clean area and was found to be approximately 0.092, making the pipe a Schedule 5. The depth of pitting was measured on the cross section and the maximum depth in the areas examined was found to be up to 40% of the wall thickness. The most severe corrosion was observed along the edges where pipe sections are joined by victaulic couplers. In order to determine the possible source of corrosion, the interior surface was analyzed for chemical composition. The analysis was performed using Energy Dispersive X-Ray (EDX). This technique is qualitative, and has the capability to determine compositions within local areas of the corroded surface. A clean area (area with no deposit) was analyzed for reference purposes and was found to contain only iron (Fe). Typical deposits and the surfaces of the pits under the deposits both contained sulfur (S), as evident in EDX below. The deposits in the pipes, which covered approximately 50% of the pipes circumference, are indicative of the level of water in the piping system. The major loss of metal in the pipes was found to be along the edges where two pipes are joined together. There was evidence of additional damage (to a lesser extent) away from the edges in areas where deposits were concentrated. In these areas the damage was more extensive under the thicker deposits (mounds). A common phenomenon in sprinkler piping systems is Under-Deposit corrosion (corrosion under the deposits). The main contributor in this type of corrosion is stagnant water in pipes. The corrosion occurs mostly in horizontal sections of the piping, where water is allowed to stand. One of the most common sources of under-deposit corrosion in stagnant water is micro-organisms in water which build up deposits and create a corrosive environment. This mechanism is known as Microbiologically Induced Corrosion (MIC). 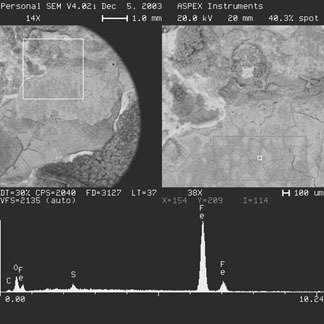 The presence of sulfur detected by EDX analysis is an indication of MIC. Sulfur is the main by-product with this type of corrosion, since the bacteria is a sulfate reducing or sulfur oxidizing bacteria, depending on the environment. The mechanism of MIC is complex, but it basically involves the production of a corrosion cell between the local areas under deposits and surrounding areas. This in turn will result in formation of pits under the deposits. The air in the pipe supplies oxygen necessary for corrosion process to initiate and continue. The location of the deposits, which is an indication of the water level in the pipes, showed the water level to be approximately 50% of the pipes volume (50% air). By Hossein Arbabi, PhD. P.E. Above is an overall view of the interior of a typical section. Close view of a pit, exposed following removal of deposits. Close view of a typical edge and cross section showing the degree of metal loss.